After the washout on Wednesday, the F1 teams were keen to get as much mileage as possible on the final day of the first F1 test in Barcelona. As things stand, there are now just four more days of testing before the start of the new season in Melbourne. Next week's test, traditionally the one where teams push for performance, will therefore be more critical than ever. It was wet in the morning, but the teams were able to move onto slicks in the afternoon as the temperature came up to a relatively tropical 15 degrees, compared to the Siberian conditions. 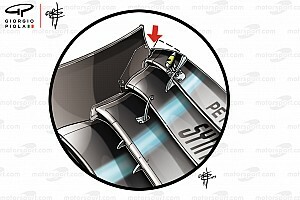 Sergey Sirotkin for Williams was the only driver not to get a run on slicks. Pierre Gasly (above) cracked out 147 laps in the Honda powered Toro Rosso, indicating that the Japanese are well on with their reliability work compared to a year ago. The Honda was also fourth fastest through the speed trap at 333km/h. 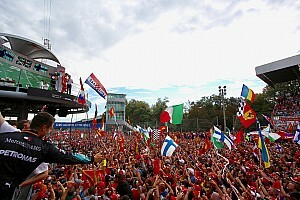 Sebastian Vettel covered 120 laps for Ferrari and the Sauber pair covered 138 between them. 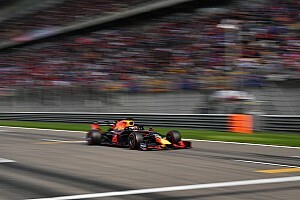 Red Bull lost time with a trip to the gravel for Max Verstappen when on a push lap on soft tyres. At 35 laps, he did by far the least running of any driver. Meanwhile Lewis Hamilton set the fastest time of the day, in the low 1m 19s on medium compound tyres. Hamilton set the time on lap eight of an 11 lap run on mediums, so not in any way a performance run. In contrast Vandoorne's second place time of 1m 19.8 was set on the first lap of a four lap run on hypersofts. Vettel set his 1m20.2 on the eighth lap of a nine lap run on softs. One thing that was immediately noticeable was the Renault powered cars down near the bottom of the (end of straight) speed trap, with Hulkenberg and Verstappen slowest on 313km/h, Vandoorne on 316. Magnussen was fastest on 336, Vettel 334 with Hamilton on 333. 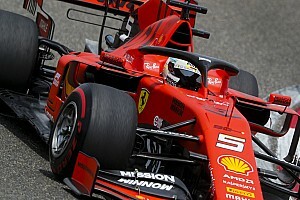 There was nothing to choose between the Ferrari and Mercedes engines on speed across the start/finish line, which is more of a measure of acceleration out of the final chicane and last turn. Renault has said that it is focussing on reliability at this stage and is at a similar power level to the peak at the end of 2017. The Melbourne evolution and the second and third engines of the season will clearly address that so it will be interesting to see when the maximum evolution of the Renault engine comes on stream. The new specification unit can be used at any time, but with only three engines to last a whole season per driver, the earlier the new spec comes into the engine pool, the more likely the driver is to need a fourth and to take a penalty. There is a tactical argument for planning that in, of course and that may be what we see. "The reliability seems better, " said Daniel Ricciardo of the Renault PU. "While the power is currently at the level where we finished last season, it remains a question mark relative to Mercedes and Ferrari. But in Australia we should have a new evolution power unit." The teams now face a challenge to get back to the UK, Italy and Switzerland as the 'beast from the East' winter weather front continues to cause travel air and road disruption across Europe and particularly in the UK. The second test will start on Monday.